I had the pleasure of attending the EBI West last week, a conference for financial advisors on evidenced-based investing. There were many distinguished speakers from the financial industry with interesting perspectives, but the content the “outsiders” to the industry brought was refreshing and enlightening; especially one who spoke about ancient Greek philosophy. I am being quite serious. He was riveting. Ryan Holiday, a best-selling author and founder of Brass Check, spoke about Stoicism. 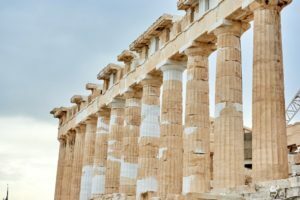 This ancient Greek philosophy is every bit as relevant today as when it guided philosophers, such as Seneca and Epictetus, as well as statesmen and emperors, such as Cato and Marcus Aurelius. Some of our most notable American presidents, George Washington, Thomas Jefferson and Theodore Roosevelt, were inspired by this philosophy. For those of you who think philosophy means sitting around and pondering life’s great questions, Stoicism is about behavior. This way of thinking challenges us to make our obstacles our advantages and to realize that it is a waste to try and control that which we can’t; invest your time in what you do have power over. Put your energy into living a good life, which means being virtuous – patient, honest, and sincere, for example. It sounds so simple and yet there are many distractions we deal with in a modern life. An endless news cycle entices us to gyrate to every hiccup, the non-stop barrage of social media dings and pings can dilute our focus – just to name a few. For investors, the market noise can push our hands into acting when we should exercise restraint. It’s a heck of a lot easier to do so when you put the work in up-front – into a financial plan – which enables you to control all those variables you can, instead of worrying about market returns (which is like worrying about the weather forecast in the future). Barring extenuating circumstances, you can control how much you work and what you earn. You can control how much you spend and how much you save. You can decide when to retire –or whether you will seek out part-time employment in retirement. Some of the devices you need to employ might not be easy – they may come at great sacrifice. Only you can determine if the price is too steep. It’s more productive to weigh the pros and cons of your options, rather than to worry about market volatility or to hope on the unlikely possibility of a winning lottery ticket. When you do take control of what you can – expect a peace to settle over you. Even if you have to work your tail off doing so, even if you make great sacrifices – it is empowering to focus your energy on actions that move the needle in the direction you want to head. When Tony and I decided that I would stay home full-time with our infant sons, we were somewhat prepared; we had saved aggressively in the years leading up to their arrival. It also gave us the incentive to start our own advisory firm. In order to do so, we both had to take courses for the Series 65 license. Tony was working full-time and made the time for this. Our sons were poor sleepers and I often was in a fog of sleep deprivation – yet I managed (with lots of coffee) to stay awake reading what I had to so I could take the test. That was certainly not the end of it. Tony continued to teach full-time, which meant client meetings took place in the evenings or on the weekends. His coveted school breaks were consumed by catching up and cramming in more meetings. He set about working towards a Certified Financial PlannerTM designation, which was another worthwhile, yet time-consuming, endeavor. Honestly, I had come to dread Christmas and summer breaks because there was always a false hope that it would be a vacation. For years, it never was. Controlling what we could made the difficult work easier because at least we knew what we were killing ourselves for – which is better than killing yourself for someone else’s benefit (which, trust me, I could have easily added a decade to my lifespan had I been smarter in my youth). Our actions were not merely driven by economics. Here is where the virtue part comes in: What we had seen happen to others, at the hands of ill-intended financial salespeople, made our work important. Our work could empower others and help them move towards financial security and the peace that comes from that. Joining our efforts with Ritholtz Wealth Management was a way to help reach more people than we would have been able to as a two-person firm. We were able to set up a program to rescue teachers from expensive options in their 403(b) plans. Thanks to Mr. Holiday, I am inspired to learn more about Stoicism and how to apply it to all facets of my life. That certainly is within my control and it’s up to me if I choose to act or merely ponder. The same is true for you. A good place to start is his website. Do You Invest Like the Cool Kids?